A fun, inexpensive project to decorate your child's bedroom. 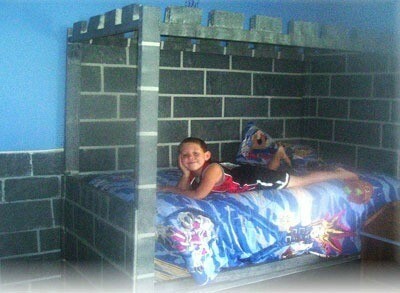 This is a guide about making a castle bed for your child. I drew the plans for this bed and my husband made it from 2x4's and cheap plywood. It only cost about $50 total for the wood and paint. There is plenty of storage underneath for our son's toys. I used masking tape to markoff the bricks/stones and sponged on black and white paint to make the stones look more real. The paint on the wall is done to give the appearance of the castle being more closed in. We also put Velcro around the top bed frame and our son can attach some cheap fabric I found for $1.00 a yard, to close in the castle for tent-like privacy. He absolutely loves this bed. BTW...my husband is no carpenter and says the bed is "rough" but our son loves it! This is really neat! Makes me wish I was a kid again. You guys did a wonderful job on this. Your son is lucky to have parents like you!